What happened to the trillions in offshore money Trump told us would be repatriated as part of his plan? American confidence in government institutions, rule of law and equal justice under law. China, Iran, North Korea, Russia wondering if Trump might be a short term president and they only need to stall him until they get back to business as usual with American globalists and surrender monkeys. Instilling confidence in thousands of potential illegal immigrants to keep on coming. What does any of that have to do with Trump’s claim? I mean, it’s not like any of the excuses that you just made weren’t known before. So either Trump made claims oblivious to the possibilities you just laid out, or he knew them and made promises he knew he couldn’t keep. Having said that I think you’re claims are totally without merit, but either way that was the worst excuse I’ve ever heard. 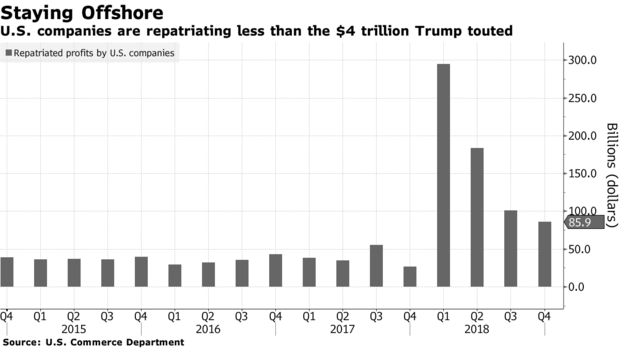 The reality is there’s no reason for US companies to send that much money back here to the states and I think Trump should have known that, which is why his plan was a total failure. The money is overseas for a reason. Even if taxes are lower, companies have very little reason to want to use it to build factories here, rather than just returning it as dividends to investors. You need to put the political hat down, and put on an economic one. BOTTOM LINE: Much better than the Obama years. Go ahead, CS, call it a lie if that makes you feel better.